"One of the staff speaks english and is very helpful." The queen hotel has 20 rooms, 7 single rooms, 3 triple rooms,1 room with 4 beds and 9 double rooms,and a total capacity of 48 places. We have a restaurant with bar for 36 people and a multifunctional place for 130 people with wireless internet, air condition, tv and smoke extractors. 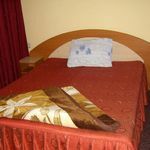 All our rooms have bathroom with shower, hot water, cold water, heat, termo windows, tv sets (with 70 channels), air condition in 8 rooms, and in the future we intend to grow the number of our rooms which have air condition. The hotel also has an inner (7 cars) and outer parking (8 cars) space, both free, available in the arrival order. Wireless internet is free of charge. The rating of Hotel Queen Arad is 8.7 from the maximum 10, 28 based on actual and valid guest ratings and reviews.